Discover up-to-date Reynoldstown homes for sale & neighborhoods in Atlanta GA below! A relative newcomer to the wave of urban revitalization sweeping Atlanta, Reynoldstown’s secret is finally getting out. But it’s still possible to find a good deal in this quiet part of town—if you know where to look. Learn more information about Reynoldstown properties for sale in Atlanta or schedule a private showing by contacting your Reynoldstown real estate professionals today. Looking for the perfect home to buy in Reynoldstown? Call (404) 270-9374 to reach The Keen Team now! Your local real estate agents are ready to help you navigate the Reynoldstown, Atlanta real estate market. It’s no secret that the last decade or so in Atlanta has been punctuated by a vastly increased interest in intown living. With converted factory lofts and meticulously restored historic homes dotting the cityscape, it may seem that all the good places have already been staked and claimed. And then, there’s Reynoldstown. Despite a location just two miles from the center of Atlanta, this neighborhood was a little slow on the uptake. But with the rise of Edgewood as a bustling commerce mecca, the overwhelming success of neighboring Cabbagetown, entertainment options in the form of Krog Street Market, and an injection of rejuvenation from the Beltline (all within walking distance), it was really only a matter of time before this collection of quaint Georgian and understated, late-Victorian homes (not to mention a slew of condos and converted spaces) became a bullseye for home hunters in search of the next cool neighborhood. Still, Reynoldstown retains the diversity that’s helped define it over the last century. Today’s residents include first-time homeowners, students, single professionals, retirees, and young families—all of whom are content to take their time and enjoy the slow, deliberate evolution of this singular neighborhood. Reynoldstown is located about two miles east of downtown Atlanta. 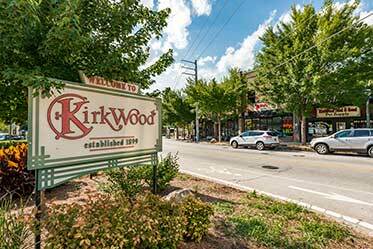 Bordered by DeKalb Avenue to the north and I-20 to the south, this part of town is located directly to the west of Edgewood and to the south of Inman Park, which affords residents ample opportunity to enjoy a variety of walkable shopping and dining experiences. Lang-Carson Park is the plot of green space most commonly associated with Reynoldstown. It’s smack-dab in the middle of the neighborhood, and is punctuated by lush lawns, sporting areas, and a few wooded gardens. Here’s a complete list of the parks in close proximity. Don’t ignore Inman Park. 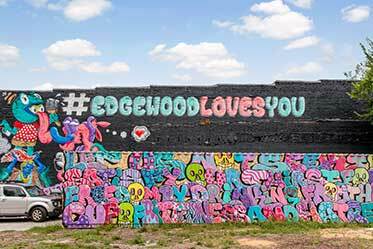 This neighborhood, which lies directly to the north, has been undergoing a revitalization of its own, and has become a destination for its Beltline access and newly established entertainment and dining district, Krog Street Market. Homehunters have got a pretty good variety of options at their disposal. In addition to the historic homes peppering the streets, this used to be a railroad town, which means that a cool converted loft isn’t too hard to come by. 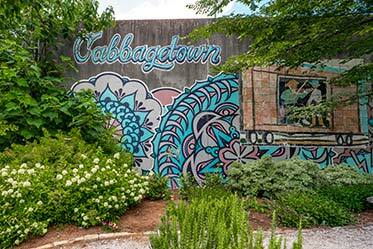 People often say that Reynoldstown is ‘joined at the hip’ with its smaller sister neighborhood, Cabbagetown. The latter’s Carroll Street is a particularly popular destination for Reynoldstowners who dig its distinctly Bohemian allure. As a newly re-imagined community populated largely by singles, young couples, and empty nesters, it’s not too surprising that there aren’t actually any schools located within the confines of Reynoldstown. However, there are some options located close by. Krog Street Tunnel, which runs under the MARTA rail line, provides access from the north, as does Moreland Avenue, which runs along the eastern side of Reynoldstown. Otherwise, drivers can access from the main thoroughfare, Memorial Drive, which runs through the south end of the neighborhood. Reynoldstown is only a few minutes away from an I-20 onramp (via Moreland Avenue). Driving westward down Memorial Drive, however, grants easy access to the Connector. MARTA access is pretty simple in Reynoldstown. The Inman Park-Reynoldstown station is located in the northwestern corner of the neighborhood, and can be accessed from either side of the elevated railway. Someday, this walking path is going to circle the entirety of inner Atlanta. For now, only a small portion of the trail has been completed, but the next stage includes access right through Reynoldstown, making the walk up to the Ponce Corridor a breeze. This annual event, held each September, features live music, a kids zone, food trucks, and a selection of local brews, all constructed around a 5K kickoff race. The event is a local favorite, but everyone’s welcome to join the fun and support the community. Interested in buying a home in Reynoldstown? Give our Atlanta real estate experts the opportunity to guide you through the purchase of your next house or the sale of your current residence. As local real estate agents, we have insight on the dynamics unique to the Reynoldstown housing market. Connect with The Keen Team for information on representation for buyers and sellers in Reynoldstown. Considering the sale of your Atlanta property? Receive a Reynoldstown property value analysis with the help of our CMA page!